Established in 1998, Zhejiang Zhongte Machinery Technology Co., Ltd is a professional manufacturer specialized in the development, production and marketing of label printing equipment. We mainly provide offset printing machine, letterpress label printing machine, flexo printing machine, slitting machine, etc. 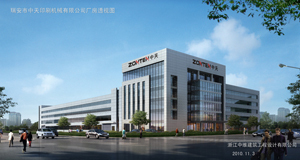 Zhongte is a national high-tech enterprise and is one of the enterprises responsible for National Torch Program. We emphasize on the introduction of international top-notch talents and we have strong technical force. Great importance is attached to technological innovation and intellectual property. We have independently developed rotary intermittent letterpress printing machine, PS plate intermittent offset label printing machine, and multifunction flexo printing machine. We have acquired 15 national patents and have been awarded Science and Technology Award of Zhejiang Machinery Industry several times. After 15 years of development, our company now has more than 300 employees and we have founded the Shanghai Zhongte Printing Machinery Co., Ltd. in Shanghai Jinshan Industrial Zone. We have passed the ISO9001:2008 International Quality Management System certification and our products have obtained CE and SGS certificates. We have fully implemented ERP management and 6S management. Adhering to the business philosophy of Win in Quality and Succeed in Professional, we have exported products to over 80 countries and regions. Due to the high-end scientific and technological strength as well as globalized marketing network, our company has become a domestic well-known enterprise in the printing machinery industry. Regarding integrity as the tenet and quality as the base, Zhongte is dedicated to providing customers with first-class products and services. In the face of the market with rapid change and fierce competition, we will continue to work hard and make unremitting efforts for the development of the self-adhesive label printing industry in China.